This week’s serene shot of bucolic bliss makes me think happy thoughts for a change. I have a little black bunny. Mummy says that is a funny name for a black bunny, but I like it. My last bunny was called Snowy, and I cried for years and years when she died. So that is why this Snowy is called Snowy too. The first Snowy ran away because I left the door to her hutch open. Then she got squished by a car. That was my fault, so I was very sad. But I am five now, well nearly, so I am much more responsible. Daddy taught me that word, it is quite grown up, isn’t it! I am worried about Snowy today. She is not eating at all. And that is a shame, because I tried so hard to make her happy. I thought she looked a bit sad this morning, so I took her to Mummy’s little work room. We found some very pretty pink thread. And I sewed her a lovely new smile. This entry was posted in Sound Bite Fiction and tagged 200 words, bunnies, childhood innocence, flash fiction, petal, short story, snowy, sound bite fiction, sunday photo fiction. Bookmark the permalink. I thought it’s a stuffed soft snowy. The story was going well except the ending. Your writing style is superb. It was such a sweet innocent story until the end – then the gut puncher! It’s hard for me to imagine her sewing a smile on her bunny! Ouch! Loved that last line – quite macabre. I am happy with that, macabre is good! Cheers, Al, glad you liked it. I thought we needed something cheery to lift the post-festive gloom! From “aww” to “eww” in 0.0001 seconds, and that’s when you’re thinking happy thoughts! Time to revise the lyrics of that Isley Brothers song to “Whenever you’re near, I hide my fears, behind a pink thread smile”. Great story. C’mon, you can’t do that to a great song! I will never be able to listen to it again without fretting about Snowy. I wish I had just squished him (or her?) too. I couldn’t help it – the song came into my head as soon as I read the last two lines. I’m looking forward to a sequel in which Snowy gets revenge. Oh my! That was all pink and fluffy and my head literally snapped back when you told me the little girl sewed her bunny a lovely new smile. Ahh! So gross and poor bunny. I hope it had a heart attack and died so it didn’t feel the needle. 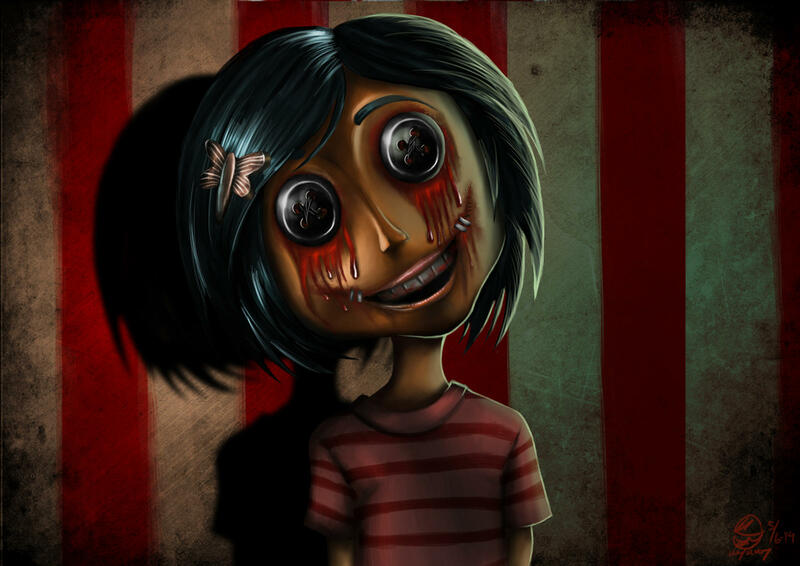 Have you ever heard of a children’s movie called Coraline. It reminds me very much of your story. Coraline enters into a new world through her house and gets a new Mom. The only difference is in this world all the creatures have buttons for eyes. So you can guess what Coraline’s new mother wants to finally — see Buttons on Coraline’s eyes. Great job story telling! Your comment is longer than my story! Glad you enjoyed it regardless. Never want to, sounds nasty. Yes, it’s a creepy children’s movie! Ooo-errr! I was utterly captivated until I got to the final few words! Great little read. Cheers, Keith, glad the twist got you. My sister had a white cat called Sooty. Hmm, a slightly macabre innocence in this case, Angie! But happy you enjoyed it. I once had a pet crocodile. Poor Snowy Mk 2. She’d be better off getting squished! Great combination of innocence and sinister. Thanks, Steve, glad it worked for you. It is a sad day when being squished is the preferred option. I’m not sure whether to be charmed or horrified. Poor Snowy, unless of course, he’s stuffed bunny.. But Petal only means well. I love the voice of the child. Enchantingly innocent. Happy you liked the voice.